1.Best to use on subjects with Glossy Surface, such as: Refrigerators, Glass, Ceramic Tiles, Stainless Steel etc. 2.Try before using is recommened, best not to use on items with surface which is not adhesive friendly, such as clothing, wool,beads. 3. Keep the disc away from the cylinder. Hold the magnet firmly when placing it on magnetic surface. Try to avoid collision. 4、DO NOT attempt to pull, lift, or pry the magnet from the Cylinder before sliding it to the edge. 5、DO NOT store in any sliver or white containers or tin box after the cylinder being taken out from the package. 6、DO NOT Attempt to snap the Magnets to each other or any magnetic surface（fridge，Iron Locker,etc ）.The Strong Magnetic Ability may result in damage to the magnets. 100% Satisfaction Guaranteed And Friendly Customer Service. Super Value Pack: 8Pcs Neodymium Magnets with 8Pcs Adhesive Stickers, Easy To Get You Project Done. 8 Pack of N52 Magnets With Great Stainless Steel Looking. Premium Quality Nickel-Coated Magnets: The Highest Quality Coating Available Provides a Smooth and Shiny Magnet,Resists Corrosion And Doesn't Scratch. Magnetic And Durable Adhesive Magnets: 1.26"D X 0.08"H, The Maximum Of the Pulling Force Up To 10 Lbs.The Strong Neodymium Magnetic Discs Are Bound To Meet Your Demands. 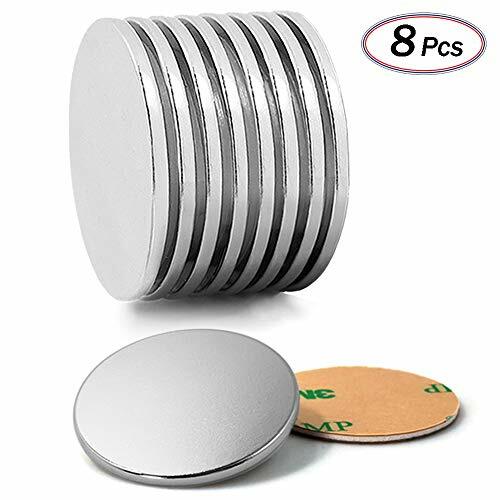 Multi-Use Round Magnets In Your Daily Life: DIY Projects, Science Experiment, Refrigerator Magnets, Cable Holder, Organize Your Stuff In Your Garage Or Lockers, Even For Craft And Arts Projects. 100% Satisfaction Guaranteed: We Only Supply Super Strong Magnets of the Highest Quality.30 Days Money Back Guaranteed! Click on the Add to Cart and lets get Sticking. View More In Industrial Magnets. If you have any questions about this product by JACK CHLOE, contact us by completing and submitting the form below. If you are looking for a specif part number, please include it with your message.